When Did You Last See A Bloater? Last week a magazine asked me to go to Sheringham in North Norfolk. I’d been there before, and to nearby Cromer famous for crabs and the pier. A bit of research turned-up Richard Little, now in his 80s he’s been fishing for crabs for over 60 years and is a Sheringham legend. 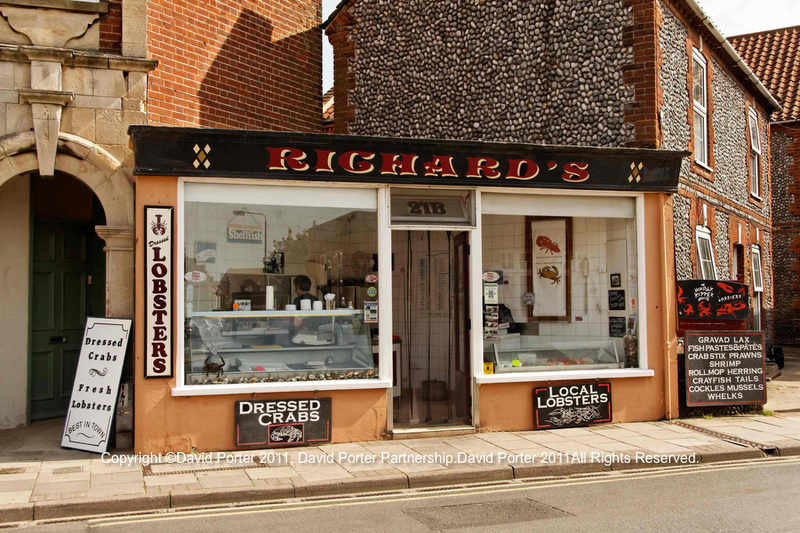 About 12 years ago Richard went into partnership with fishmonger Angela Barrows, and together they opened “Richard’s” a seafood shop in Church Street. I rang Angela and asked her to arrange for me to meet Richard at the shop, she told me ring on the way. With visions of crates of live crabs being unloaded from an old wooden fishing boat by an even older fisherman, just past Fakenham I stopped and telephoned Richard. But he was too busy to see me. No amount of wheedling, “…but I’m coming all the way from London…its a 300 miles round trip…please…” would change his mind. “Leave me alone,” he pleaded. Fishermen always have one eye on the tide, and I expect he had pots to pull or nets to mend. 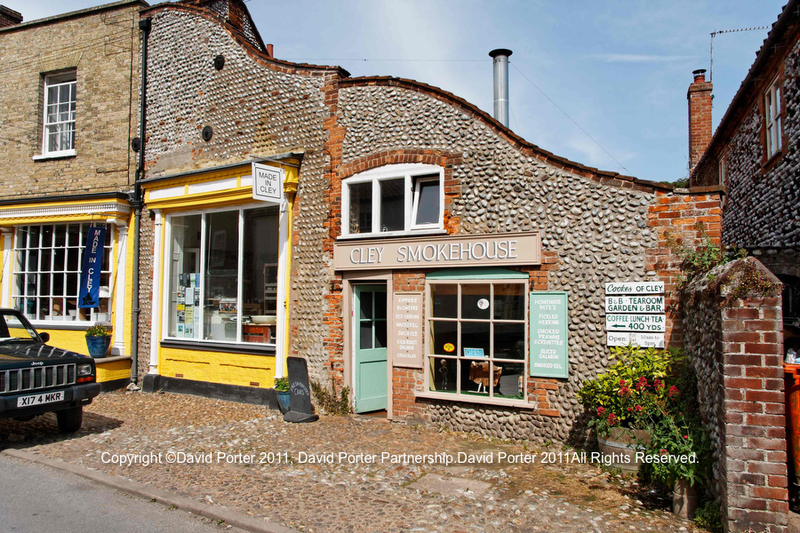 Nevermind, I thought, I’ll turn the car towards Cley Next The Sea (pronounced Cl-eye) and visit the Smokehouse. The Cley Smokehouse never disappoints, and after deliberating over the possible delights of smoked eel and smoked prawns, I bought two bloaters for about £3. Bloaters have all but disappeared from the nation’s fishmongers, and most people have neither heard of bloaters nor tasted one. 150 years ago bloaters were the most popular smoked fish , more popular than kippers, and always associated with Yarmouth in Norfolk, where the locals described themselves as Yarmouth Bloaters. Yarmouth was founded on the herring fishery, just 100 years ago Yarmouth was home to 3,000 herring boats, and in the season 5,000 women were brought by special trains to gut and pack the herrings. The shoals moved down the East Coast for 6 months followed by these migrant fishworkers. Bloaters are herrings, salted or brined and then cold smoked whole, with their innards intact, for up to 18 hours. 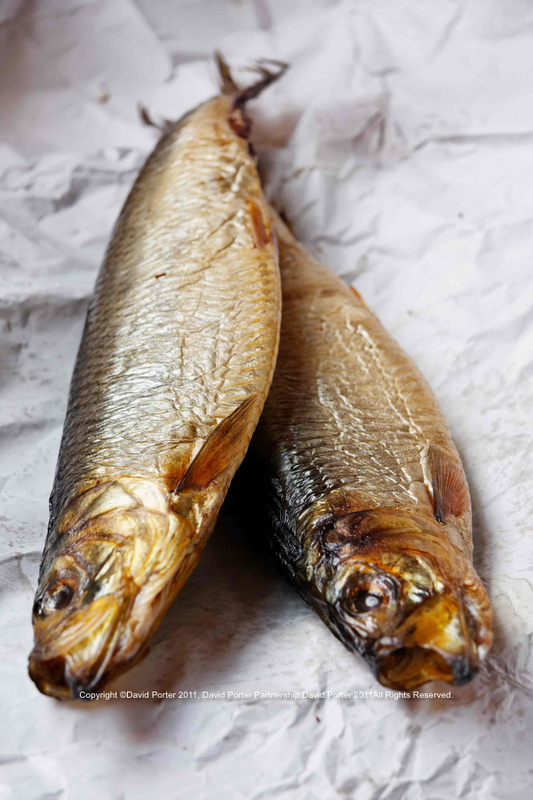 Smoke them for longer, perhaps 3 weeks, and they become the legendary ‘Red Herring’, crisp and very dry. But after 18 hours the result is a light smokey taste, not so strong as a kipper, and because a bloater is a whole herring the flesh stays plump and moist, bloated. 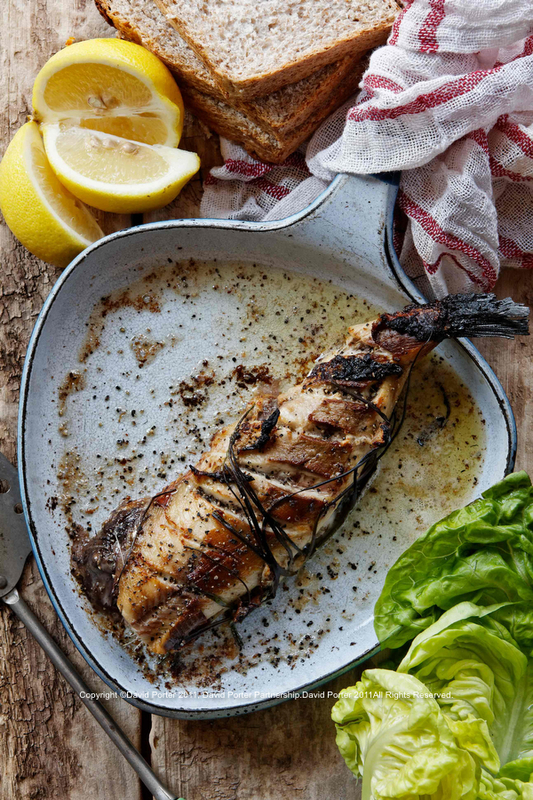 Cold-smoking doesn’t cook the fish, it lightly cures them, fish have been preserved by smoking and salting since prehistoric times, but these days the smoke is more of a flavouring than a preservative. 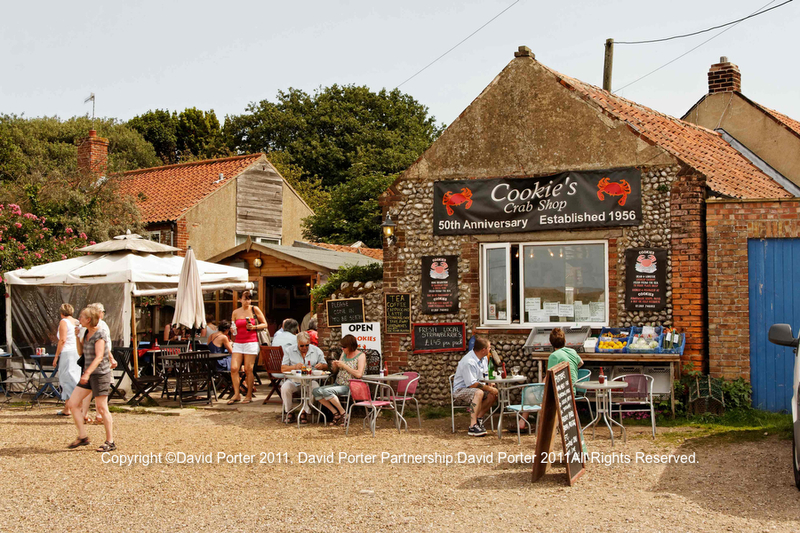 Along the coast road I stopped at Cookie’s Crab Shop in Salthouse, every time I’d been in the vicinity of Cookie’s it had been closed, but today it was very much open and busy. I joined the queue and bought a crab sandwich (£2.70), and mused at the perfection, simplicity and sheer freshness of this quintessential English sandwich, compared with the usual pre-packed sandwiches you see in supermarkets and service areas. Continuing towards Sheringham along the coast road I passed cottages offering ‘Crabs: Boiled and Dressed’, and ‘Samphire’. I thought to myself that if I lived here I’d probably live on crab, and samphire too, when they were in season. In Sheringham I drove around looking for Richard’s, a friend had asked me to bring back some bloater paste. A nice lady (Mrs Little?) sold me the last pot of bloater paste (£1), and a whole boiled crab (£3). We had the bloaters the next day, though they’ll keep for a week in the fridge, the fresher they are the better. I deliberated about the possible cooking methods, grilling or baking, and decided on grilling them as recommended by Jane Grigson in ‘English Food’. By chance I’d been given a lettuce, and not any old lettuce. It was the opening day of the Brockley Open Studios, and Clarissa was showing her paintings and drawings, we fell into a conversation with Laszlo, a new neighbour, who noticing the lettuces, beans and tomatoes growing in our front garden enthusiastically told us about all the things he was growing in his garden. He promised return with a special lettuce, a Fat Lazy Blonde. I thought he was joking but no, there he was beaming and holding a large plump floppy lettuce. 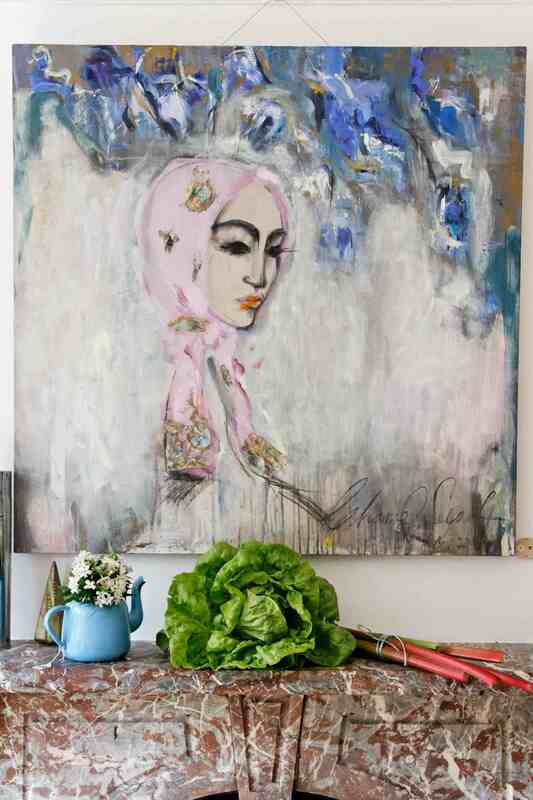 The Fat Lazy Blonde is a heritage lettuce, something the Victorians’ would have recognised. The name is a corruption of Grosse Blonde Paresseuse, a French butterhead lettuce from 1859, and as the name implies a comfortable laid-back leaf! The lettuce took pride of place on the mantlepiece under “Chanel Headscarf” and next to some rhubarb brought by another visitor. You’ll need 1 or 2 bloaters per person. Cut off the heads and fins. Prepare the mustard butter by simply mashing the mustard into softened butter, do it to taste. You could add some chopped chives if you wish. Slash 2 or 3 cuts into each side of the bloater and brush with the mustard butter. Lay some chives across the bloater and put them one at a time in a buttered pan and place under a hot grill for 2 minutes each side. Scatter with black pepper and serve with plenty of chunky bread, and a quarter of lemon. I added some Fat Lazy Blonde lettuce leaves, a perfect foil for the hot fish.